Unlike any other martial arts style, Kuk Sool Won™ is headed by one master who maintains a strict quality control over all schools that teach Kuk Sool, ensuring that all students learn the art as it has been taught for thousands of years. 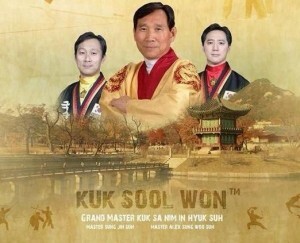 Our Grand Master is In Hyuk Suh, whose title is Kuk Sa Nim, or National Instructor. In Hyuk Suh originally organized the many different facets of ancient and contemporary Korean martial arts into the current curriculum of Kuk Sool Won™ and he is the founder of the World Kuk Sool Association™, formally establishing it in Korea in 1958 Grandmaster SUH’s introduction to the traditional Korean martial arts began at the age of five in the early 1940’s. His first teacher was his grandfather SUH, MYUNG DUK, who was a Master Instructor of the Korean Royal Court army before the Japanese occupation of Korea in 1910. After returning to his hometown of Taeg, Grandmaster SUH, MYUNG DUK secretly taught only members of his immediate family, continuing the family’s tradition of practicing the martial arts as it had been done for sixteen generations. When SUH, IN HYUK was old enough to begin his training, he immediately showed such promise that his grandfather decided that he would be the one to whom he would give the greatest attention. Sadly, SUH, MYUNG DUK was fatally wounded in the Korean war in 1952. However, the young SUH, IN HYUK continued his training under various masters of the traditional Korean martial arts, thanks to letters of introduction written by his grandfather which opened doors that otherwise would have remained firmly closed. In 1958, after many years of study, SUH, IN HYUK systematised and organised the myriad techniques he had learned and created the art of Kuk Sool Won™. It was at this time that he revealed a secret inheritance from his late grandfather of a compilation of five books containing all the knowledge of the Korean Royal Court. With the inheritance of these books, the title of KUK SA NIM was bestowed on the young master, which means, ‘National Martial Art Teacher’ – a title officially recognised by the Korean Government. In 1961, Kuk Sa Nim established the KOREAN KUK SOOL ASSOCIATION. Kuk Sool Won had now become the official name to represent, not a style or type of martial art, but rather a systematic study of all the indigenous traditional martial arts of Korea, dating from ancient times to the present. From 1961 onwards, Kuk Sa Nim began his quest to spread the knowledge he had gained to the Korean people and established many schools throughout Korea. In 1974, Kuk Sa Nim emigrated to America where, in 1975, he established the WORLD KUK SOOL ASSOCIATION. Since that time, many hundreds of schools have opened throughout the USA, as well as in several other countries including Gt. Britain. It is now considered that worldwide, over one million students have passed through the doors of the Kuk Sool Won™. Over the years, Grandmaster SUH has received many honours and accolades which include: holding the keys of several cities of the USA; being featured in numerous international martial art magazine articles as well as appearing on the front covers and TV appearances in several different countries of the world. Most recently in 1999, Grandmaster SUH was the subject of a one-hour long documentary film made by Korean TV entitled “KUK SA NIM”. This documentary chronicles his life story from those early beginnings in Korea, to the present world recognition of his achievements within the martial arts. With the publication of this documentary, Grandmaster SUH has become one of the most famous Korean nationals residing outside of Korea.